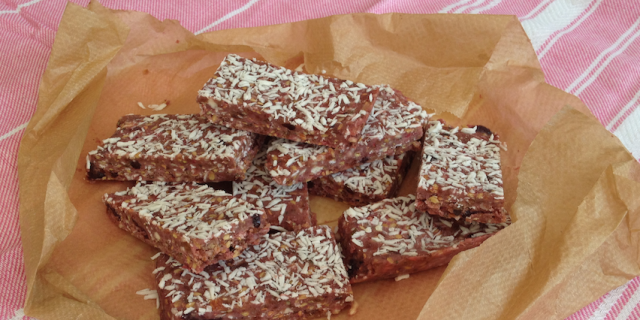 These Pink Power Energy bars with raspberries, cranberries and coconut can help raise your energy levels and keep your energy up on a busy day or during your work-out. I am so happy with how these bars came out as they taste absolutely amazing. They are really healthy too and have just the right balance of nutrients to maintain your energy. Without fuel, it’s hard to keep your energy going on a stressful day or during an intense work-out. Proper fuel can help you manage the stress of a busy day at work or help you to sustain your energy levels during a training session. What you eat prepares you for what is ahead, whether it is a stressful day at work or an endurance training. Energy bars can provide a sustained source of energy. When it comes to exercise, eating the right nutrients is essential. If you train for over an hour, you should consider refueling during your training session too. These Pink Power Energy Bars give you balanced energy. They are easily digestible and can be eaten before or during a training. They will help you maintain your energy levels and boost your performance. They have the right balance of all the nutrients you need. Simple carbs in the form of raspberries and dates, protein in the form of hemp and flax, healthy fats in the form of almonds and electrolytes in the form of sea salt. Add all ingredients to a food processor, except for the coconut flakes, and mix well. I like a bit of crunch to my energy bars so I take them out before it becomes a smooth mixture. You can also use your hands to mix everything together. Using your hands, mix in the coconut (leaving some aside for the topping). Line a small square baking tray with baking paper and add in the mixture. Smooth it out until you have your desired thickness. Sprinkle the rest of the coconut on top and, using your hands, press the coconut into the mixture so it’s no longer loose.